Space-folk duo Astralingua capture the passionate, playful, and pained depths of William Blake’s poem in “A Poison Tree,” a hauntingly rich musical adaptation full of delicate intimacy and celestial sweetness. Much has been said of William Blake’s 1794 poem “A Poison Tree.” An intimate confession and bitter lament all rolled into one, the piece brilliantly fuses themes of anger and revenge into a four-stanza story with a dark end — but we can leave the deeper dissection to high school and college English classes. 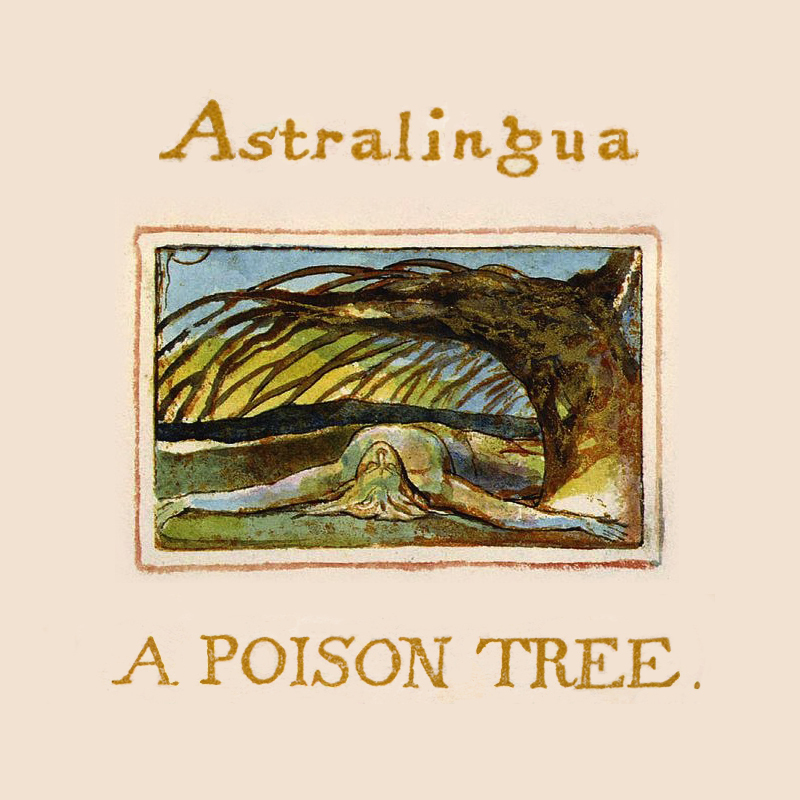 Space-folk duo Astralingua capture the emotional depth of Blake’s poem in their song “A Poison Tree,” a hauntingly rich musical adaptation full of delicate intimacy and celestial sweetness. Atwood Magazine is proud to be premiering “A Poison Tree,” the sophomore single off Astralingua’s forthcoming album Safe Passage (independently out March 5, 2019). The Denver, Colorado duo of Composer Joseph Andrew Thompson and backup vocalist Anne Rose Thompson, Astralingua first came to being a decade ago as an experimental world fusion/rock project, releasing their debut EP Contact in 2008. Ten years later, the Thompson-led artistry returns with eerie acoustics and an identity labeled “space-folk,” which is explained in-depth below. Described as a concept album of “mortality, isolation, death, and the movement between worlds,” Safe Passage is shaping up to be a thrilling experience with lead single “Plunge” and “A Poison Tree.” The new song expands to fill the air with a hazy mix of darkness and light as Astralingua send shivers down the spine. Stream “A Poison Tree” exclusively on Atwood Magazine, and dive into Astralingua’s astral world in our interview below! Safe Passage is out March 2019. Atwood Magazine: Why are you releasing “A Poison Tree” as your second single in 2018? Astralingua: With our singles, we are trying to introduce the various sides of our aesthetic. They’re all very different from one another in musical style and production. We want to demonstrate that even though you might not know what to expect from us at any given point, you can trust it will be interesting, crafted, and meaningful. We like strings, mythology, and, of course, William Blake. Much of the rest of our coming album Safe Passage focuses on heavier themes. This track, with its playful story and instrumentation, seemed a better fit for the holidays, and we are releasing it as close as possible to Blake’s birthday, November 28th. The end of the year is a time of nostalgia and remembrance, where people refocus on traditions and celebrate the lore of the past, of which Blake is a part. What spurred this new music? Astralingua: First and foremost, our love of William Blake and his work. The lyrics are taken from the poem of the same name, which Blake published in the collection Songs of Innocence & Experience (1794). Joseph always wanted to make an adaption of this poem and this record offered the right opportunity. It fits right in with the themes explored in Safe Passage’s other songs (mortality, isolation, struggle, and moving between worlds) and allowed us to pay homage to one of the true greats. In production, he tried to give it a more ‘minstrel’ sound, to place it in the right era and also allow it to have a more ‘story-teller’ style. How do you define the music you make - your sound, your style? Astralingua: Ours is composed, crafted, acoustic music performed by humans, with each note deliberately chosen. If a giant solar flare blasted the earth, blew up the power grids, and wiped the drum samples off of everyone’s hard drives, Astralingua could still perform that night. There’s a magical longing in our sound, a reaching for some kind of solace found in another world. We write catchy melodies and always feature haunting, eerie vocal harmony. The lyrics are crafted, and discuss matters of the soul, questions of consciousness, and the complex inner world. There are no love or drinking songs. SPACE: It’s spacey, space-out music. Musicians call something “spacey” when it features openness, slow tempos, and long echoes. Others use “spacey” to describe works that are “far out” and have a atmosphere of escapism. We often use strange soundscapes and liminal themed lyrics. We try to come at you from a direction in the cosmos that you’re not considering, or better yet, take you to one. The development of human space exploration and astrophysics has presently led to string theory, which is thought to describe an enormous landscape of possible universes. When you look into the sky and contemplate the cosmos, you are ultimately led to consider alternate realities and dimensions. That’s outer space. When you talk to the dead in a dream, that’s inner space. It’s from these kinds of mind-states which our music comes. FOLK: We color our tracks with the kind of acoustic instruments you hear in the varieties of Old World folk – strings, woodwinds, mandolins, hand percussion, and the like. We strive to create music that will be relevant across multiple generations and landscapes, handed down by players of instruments, and not just something in a party song playlist of 2018 that won’t withstand the test of time. In many cultures, folk music is used to relate spiritual or mystical experiences, which we also seek to do. How would you define this song in the context of Astralingua as a whole? Astralingua: We’re a multi-faceted band and this is just another side of us – instead of writing more of our own lyrics, we adapted an 18th century poem by a visionary Master of art and literature. In essence, we collaborated with the dead. We created the name Astralingua to mean “language of the stars” or “language of the astral plane.” To us, Blake’s works are a form of astralingua, in that they seek to define something intangible and illuminate the workings of the human soul. Our adaptation of this poem is a moment where we give our respect to Blake and show our own playful side, by joining in with his.